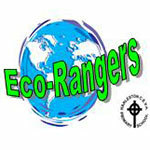 Who are the Eco Rangers? Each year, a child from each class is elected to stand as an Eco Ranger representative for their peers. These children, along with staff and governors, commit to improving and caring for the school environment whilst encouraging others to do the same. We have held the Green Flag award for 7 years for our commitment to being an Eco School. We were first awarded this in October 2010 and since then, we have successfully renewed it three times, most recently in November 2017. This is all due to the continual hard work of the Eco Committee. In March 2016, we were proud winners of the Primary School category in the Norwich and Norfolk Eco Awards. Our work with Swift Action, a local community group which aims to increase the population of swifts in the area, caught the attention of judges and they were impresses with how the project has “sought to engage with parents and the wider community”. During the year, the children gathered and analysed data, wrote letters, led assemblies and created artwork on this theme with the help of the rest of the school. This year, we are looking to reduce the amount of waste we produce at school, beginning with introducing composting of our fruit and veg waste, and work towards gaining the Bronze award. As part of our Eco Schools work, the school looks at some of the nine key topics: energy, water, litter, waste, transport, healthy living, biodiversity, school grounds and global citizenship. Our chosen topics are addressed through whole school projects and initiatives as well as through work carried out in class as part of the curriculum. The Eco Rangers monitor how environmentally friendly classes are by checking the use of energy in the classroom and how much waste has been recycled. Walking is also been a strong focus through Walking Wednesdays when registers are taken to document how many children have walked, cycled or scooted to school. Walking Buses are also organised from the town to encourage those who would not ordinarily walk to meet up with friends and walk to school together. This year, the Eco Rangers, have worked together to find further ways to encourage children to look after their school environment. Following the success of our litter-picking scheme in which children are rewarded when they help clean the school playground at lunchtimes, the Eco Rangers have provided compost collection points for fruit and vegetable waste produced at break times and lunchtimes. The Eco Rangers are responsible for collecting and adding this to our compost bins. The compost produced will be used in our vegetable and flower garden that we are in the process of rejuvenating. In addition to the regular work undertaken in school, the Eco Rangers also have other opportunities to take part in activities and project work both on and off site. This includes organising at least one Big Tidy Up during the year when they collect litter in and around the town and think of other projects which they can involve the rest of the school community in.